In a week defined by a powerful story about poverty and homelessness in New York, a bit of a bright spot: The City's Department of Housing Preservation and Development chose a scheme for a truly massive affordable housing development in Queens—all told, the development it's part of will add a whopping 5,000 units to the neighborhood. The proposal was created by developer TF Cornerstone, nonprofit Selfhelp, and architects ODA. 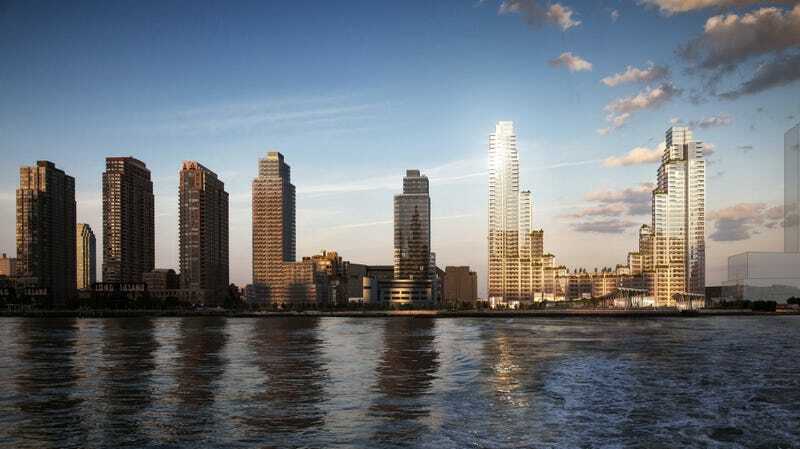 It shows a massive pedestal along the waterfront in Long Island City, upon which two glassy towers rise from a series of Art Deco-esque set backs. Inside, the building will contain 1,193 apartments—with 66 percent of those being offered as "affordable" housing, while 100 more will be reserved for low-income senior citizens. More affordable housing stock is never a bad thing—and it gives us pause to think about the ways in which New York's last major generation of affordable housing developments fell short. LeFrak City, the next largest development (built in the 1960s), is a classic "tower in the park," a popular model for public housing projects at the midcentury—but one that proved to be rife with problems, like the isolation of inhabitants from food and transit and poor construction quality. Of course, this plan for Long Island City is operating under a completely different set of circumstances—and it'll add much-needed housing stock to a burgeoning neighborhood. But it's interesting to see a long-lost dream of modernism still echoing through New York, after so many decades.